Once installed you will need to install the plugin's templates manually (this is a known issue and will be fixed soon). Instructions are forthcoming. Once installed this plugin augments your current site by publishing additional pages optimized for a hand held device. The mobile templates provided by this plugin therefore live alongside your non-mobile templates. Users access the mobile version by clicking through on a special URL you specify when you install the templates. DO NOT apply this template set to an existing blog. Doing so will destroy your current design. For the time being this template set should be installed manually. This template set only accepts comments from registered and authenticated users. How did you crop the entry images to square size on the live demo page? Is it possible to do this in movable type? I usually use like [MTAssetThumbnailLink height="250"] to resize images, but I can't resize it to square because the original image is rectangular. If you could give me some pointers it will help me greatly! Thanks in advance. i installed this manually as described, went to my iphone and I still see the normal version of my blog.....any additional instructions? thanks for the reply! I guess by your response that I am assuming this plugin does more than it does. that is cool, I just want to clarify. So my assumption was that it sniffed the browser and then pointed to the new templates and css if a mobile browser was found. I now see that you have a /mobile structure established. Is that done via a re-direct in the .htaccess file? It is done through an .htaccess file. I have augmented the documentation above with instructions on what you need to do. Still wonder what you mean by "Users access the mobile version by clicking through on a special URL you specify when you install the templates." since I ftp'd the files over, am I cutting and pasting the template file contents into the MT template gui? This looks great, but I am totally lost on installation. So... yeah. I realize that the install is wicked easy now, but getting it to publish with the templates seems much harder - like I'm not sure what to do here. I tried to create a new index for the mobile directory, but then it occurred to me - I don't know where I tell the plugin to use that directory. I checked thru the whole interface, and I don't see any options for the plugin - am I missing something? Lost on installation too. You should document how to install templates manually and specify the url to the mobile version in the README file. I installed the plugin as per the instructions in the tinyURL. So all the files are in the right place. "Once installed you will need to install the plugin's templates manually (this is a known issue and will be fixed soon). Instructions are forthcoming." "DO NOT apply this template set to an existing blog. For the time being this template set should be installed manually." Then you simply put the rewrites in the .htaccess for the root of the site? 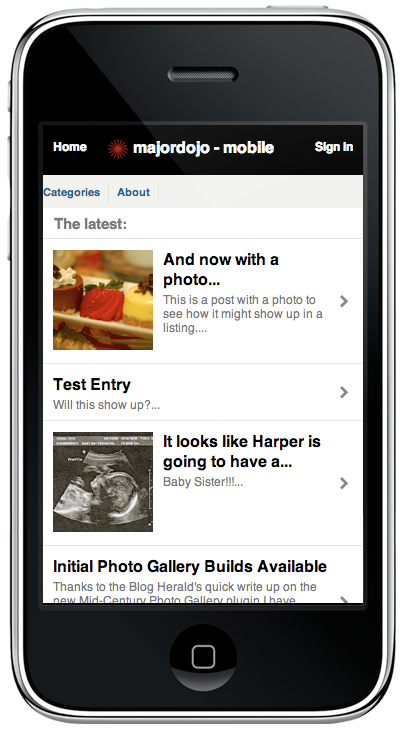 Enabling the mobile feature is as simple as going to theme options and selecting "Enable Mobile Version". Thanks! But what if I'm happy with my current theme, and only want to add a simple mobile version? Can I do that, or do I have to move my whole site onto your theme? That should, in theory, do it. And, then, once I get that working... physically, to copy a template from one blog to another, I would do that in the Movable Type interface? Or some other way? Will this mobile template work with MT 3.3x? I'm od my third tour of trying to make this work - still limited success. I've never been able to make that redirect work on my server - a subsequent one I found did - but it's redirecting the CSS to - which doesn't work. Also the 'copying' of the templates won't really work as you can't chose the proper "template type" without refreshing the templates (which I would not recommend in a LIVE environment with customer templates). Hello Thanks for this. One question: Ready for MT 5 ? I cant use in mt5.. Can help me?